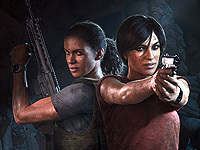 In India, treasure hunter Chloe Frazer has enlisted the services of mercenary Nadine Ross to help her find the legendary tusk of Ganesh, son of Hindu god Shiva, who lost the tusk while defending his father's temple, a search that previously consumed Chloe's own father before eventually claiming his life at the hands of bandits. Aided by a young merchant named Meenu, whose father is in the Indian army, Chloe moves past an insurgent group and meets up with Nadine, who helps her sneak into the office of the insurgents' leader, Asav, who's also after the tusk, ostensibly planning to use it to rally the people into revolution. The two steal a map made by an unknown expert pointing toward the tusk within the ancient Hoysala empire and a disc that acts as a key before escaping Asav's forces.